a heart surrendered: Quotes to encourage-challenge-inspire us as we train our children in righteousness. Quotes to encourage-challenge-inspire us as we train our children in righteousness. Getting to the hearts of our children takes much more time, energy, and effort than simply stopping a behavior - but the results are worth every discussion, every sleepless night, and every sacrifice made. I trust the Lord will use these words to encourage and inspire other parents who need a little "pick me up" in this long race called Parenting. We were not meant to run this race alone. We need each other! We need to PRAY for each other. And more than anything, we need to push each other back into Scripture so we can find the wisdom, the help, and the strength we need to be obedient to God's call to "train our children in righteousness." 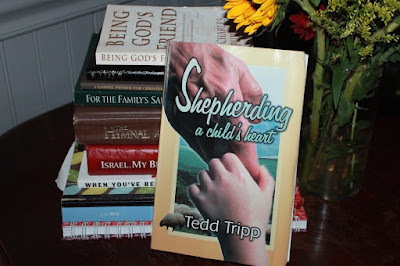 "Training and shepherding are going on whenever you are with your children. Whether waking, walking, talking or resting, you must be involved in helping your child to understand life, himself and his needs from a biblical perspective (Deuteronomy 6:6-7)." "All behavior is linked to an attitude of the heart. Therefore, discipline must address attitudes of the heart. Your concern is to unmask your child's sin, helping him to understand how it reflects a heart that has strayed. That leads to the cross of Christ. It underscores the need for a Savior." "If correction orbits around the parents who has been offended, then the focus will be venting anger or, perhaps, taking vengeance. If, however, correction orbits around God as the one offended, then the focus is restoration. It is designed to move a child who has disobeyed God back to the path of obedience. It is corrective." "The chief end of man is to glorify God and enjoy Him forever; therefore, your objective in every context must be to set a biblical world-view before your children. From their earliest days, they must be taught that they are creatures made in the image of God - made for God. They must learn that they will only "find themselves" as they find Him." "It is our task to faithfully teach our children the ways of God. It is the Holy Spirit's task to work through the Word of God to change their hearts." "If you address only behavior in your children, you never get to the cross of Christ. It is impossible to get from preoccupation with behavior to the gospel. The gospel is not a message about doing new things. It is a message about being a new creature. It speaks to people as broken, fallen sinners who are in need of a new heart. God has given His Son to make us new creatures. God does open-heart surgery, not a face-lift. He produces change from the inside out." "Instead of talking to our children, we should seek to talk with our children. Communication is not a monologue. It is a dialogue." "One of the most powerful ways we can warn our children is to fill their heads with the cautions of the Bible." "Honest, thorough, truly biblical communication is expensive. Insightful and penetrating conversations take time. Children require both time and flexibility. Children do not pour out their hearts or open themselves up on a demand schedule. A wise parent talks when the kids are in the mood. In those times, when their conscience is stirred, you need to talk. This may require dropping everything else to seize a critical moment. You must become a good listener. You will miss precious opportunities when you only half-listen to your children." "You must regard parenting as one of your most important tasks while you have children at home. This is your calling. There is nothing more important. You have only a brief season of life to invest yourself in this task. You have only one opportunity to do it. You cannot go back and do it over."